Are Faxed Legal Documents Legal for Court and Finances? A faxed copy of a document is not the original and, obviously, neither is a copy of an original document. The original is the original, and anything else is, well, not the original. But does a faxed document have the same legal authority, particularly when it comes to financial and business issues? In other words, is a contract still legally binding if the only signatures on record are faxed copies? The short answer is that it depends. It depends on the state, the matter, the jurisdiction and, most importantly, the parties involved. The term fax is short for facsimile, used in this case to mean an electronically reproduced image of an original document that is transmitted over phone lines from a sender to the recipient. Fax machines were first introduced to the business world in 1964 by the Xerox Corporation. But the popularity of the fax machine didn’t take hold until the 1970s when fax machines became more affordable. An original document was scanned by an optical scanner then transmitted to another fax machine where a copy of the original document appeared. But the emergence of email and digital files has resulted in the gradual decline of fax machine usage, especially in the past decade. Faxed copies of the original document were then considered simply copies and not the original document. 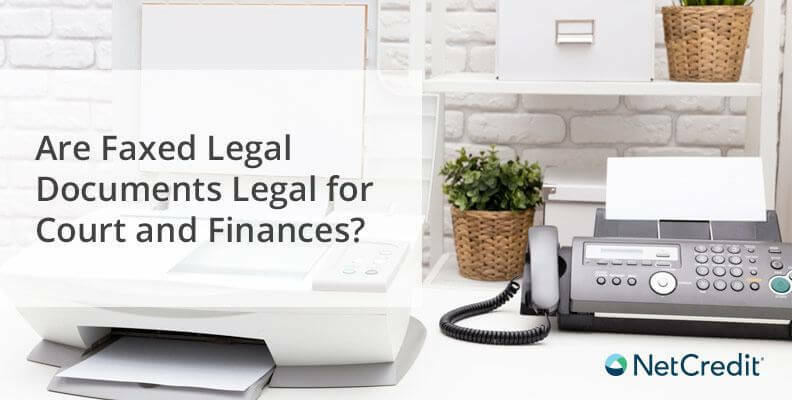 Now with the fax machine nearly extinct and replaced by scanned and emailed versions of original documents, are scanned copies of an original document legal for court and financial transactions? In legal and financial documents that require a signature, there are terms called a “wet signature” and a “dry signature.” A wet signature is the original signature, so-called because it was once, albeit briefly, wet from the ink on the document. A dry signature is a copy or a faxed version of a wet signature. Do dry and wet signatures carry the same legal weight? Usually yes. But a lender can have its own internal guidelines. For example, a borrower is buying a home and he is asked to review, sign and return (via fax) the signed documents to the lender. The lender will proceed with processing the loan application, but the original “wet signature” documents must be included with the final loan file as a condition of issuing funds to the borrower. If the borrower no longer has the original (signed) documents that were faxed to the lender, the borrower will need to re-sign a new set of identical documents at the mortgage loan closing table. Lenders have increasingly begun to accept signed and faxed documents as sufficient to complete a contract. However, the age of faxed documents may soon be nearing its end as many businesses are now turning to digital signatures to finalize documents. Digital signatures can allow borrowers to review and sign documents online – without having to print and add a “wet signature” (unless specifically desired by one of the parties involved). If there is any doubt as to whether or not faxed agreements between one party and another are legal, it is addressed by both parties agreeing beforehand that a faxed copy serves the same purpose and is just as legal as an original document. Today, many electronic agreements between a business and a consumer have similar language when entering into an agreement. But if there are any questions ahead of time regarding the legality of a faxed or scanned document, get those questions answered upfront before getting into a binding arrangement with any business or individual.